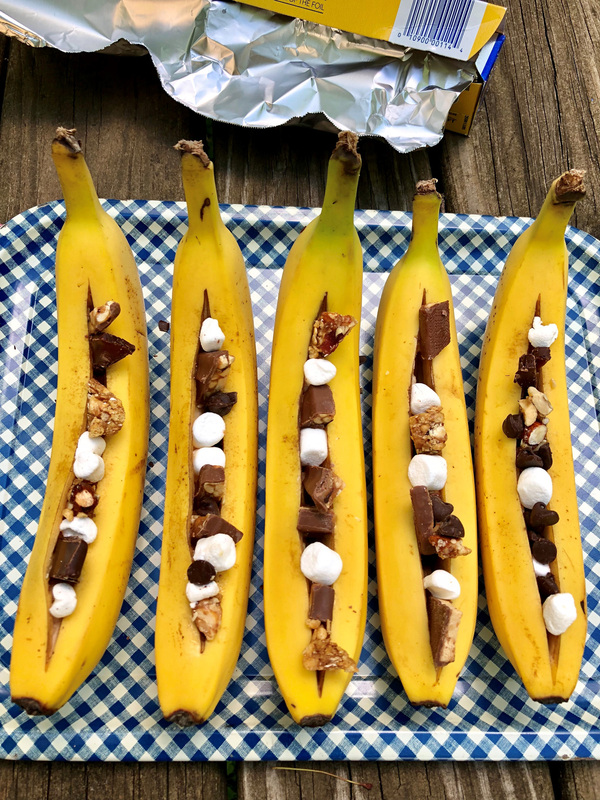 You can create, concoct and cook this yummy “Banana Boat” dessert treat with kids on a camping trip, or fire up the grill at a designated picnic spot at a city park or in your own back yard. Benjamin Franklin gets credit for saying that there are only two things certain in life: death and taxes. Hey, Ben, do you mind if I add bananas to your list? No matter the time of the year, I’m always certain that when I take a trip to my local grocery store, there will be a bunch or more of the yellow treasures that end up in my shopping cart. They are relatively inexpensive, healthy (potassium rich), and they come naturally well-wrapped. Toss bananas in your kids’ sports bags when they head off to soccer practice, or tuck them in your carry-on for an instant snack on a flight to your summer destination. You just can’t beat that dependable, always in season, always there banana. No, I’m not a spokeswoman for the banana council, but I am a real fan of the fruit, even if I sometimes complain that they seem to go from yellow to brown way too fast, or when they end up getting smooshed in the bottom of a kid’s backpack, not to be discovered for a week or two. Here is another reason to make certain that enough bananas make it home from the grocery store. 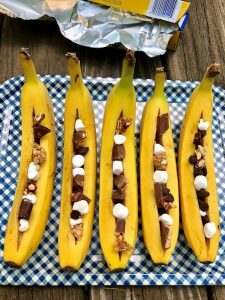 You can create, concoct and cook this yummy “Banana Boat” dessert treat with kids on a camping trip, or fire up the grill at a designated picnic spot at a city park or in your own back yard. 1. Slice each banana just through the skin, lengthwise without removing the peel. Use a teaspoon to scoop out a small amount of the banana the length of the slice, to create a little cavity. Tuck the chocolate bits and pieces and the marshmallows into the cavity of the sliced banana. 2. Wrap each entire banana in foil, and place directly in the coals of a campfire or on a grill. Cook until chocolate and marshmallows are melted, about 8-10 minutes. Remove with tongs. Unwrap and eat with a spoon. Yummy! Cook’s note: Add nuts, granola, dried fruit or other toppings, if you wish. Tip: If you have extra bananas that are starting to turn brown, peel them, wrap in plastic wrap, store in a freezer bag and freeze. Eat them whole while slightly frozen, mash them for baking, or toss into a blender with favorite smoothie ingredients.